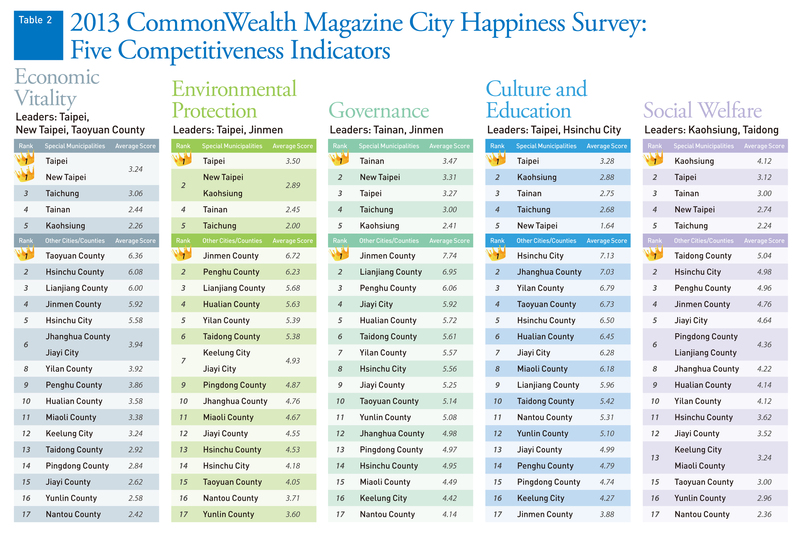 Taipei and Jinmen have emerged as the winners of CommonWealth Magazine’s 2013 City Happiness Survey. The survey evaluated Taiwan’s 22 administrative districts in two separate divisions, reflecting the disparity in resources available to governments in the different groupings. Competing in one division were the five big "special municipalities" of Taipei, New Taipei, Taichung, Tainan, and Kaohsiung, which boast 60 percent of the country’s population; the other division consisted of Taiwan’s remaining 17 counties and smaller cities. 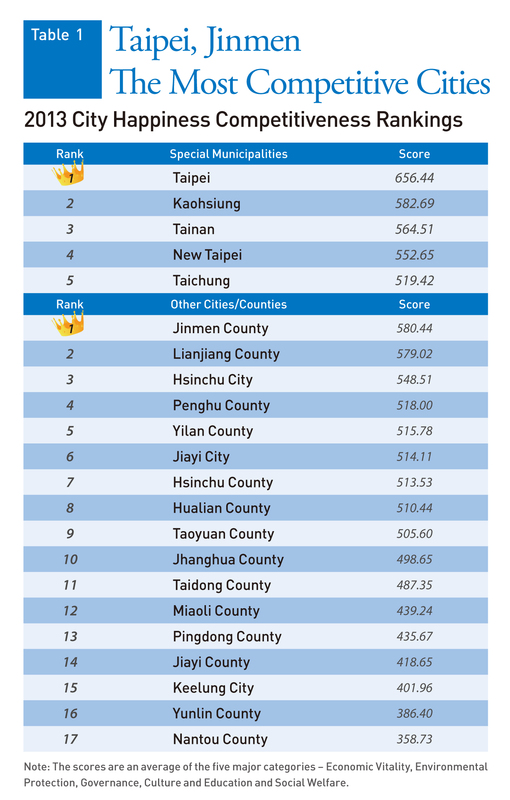 That Taipei topped the special municipality division was no surprise, but Jinmen’s ranking atop the second grouping raised a few eyebrows, especially since it was included in the survey’s rankings for the first time. That was also the case for second-place Lianjiang County (Matsu). Add Penghu County, which finished fourth, and three of the five localities in Taiwan with the greatest sense of well-being were outlying island counties. The most significant trend in this year’s survey was the opposite directions being taken by the special municipalities and the second-tier localities – the former stressing internationalization, the latter localization. The City Happiness Survey evaluated local governments based on objective indicators and subjective polling in five major categories: economic vitality, environmental protection, governance, culture and education, and social welfare. Taipei led the special municipalities in three of the five categories to maintain its status as the most competitive city in Taiwan because of two main factors: its status as the country’s capital and its strong economic foundation. In a key indicator of economic vitality – total business revenues – Taipei alone had 80 percent of the sales of the four other special municipalities combined, signaling its economic might. As the base for many of Taiwan’s biggest companies, Taipei was also the only administrative district in the country with median household disposable income exceeding NT$1 million. "Key indicators, such as the amount of spending on education, science and culture, social welfare spending per capita, and per capita spending on environmental protection, all depend on actually having money to spend. Taipei naturally has governing advantages," says Jay N. Shih, former head of the Research, Development and Evaluation Commission and now a professor of public administration at National Chengchi University. Beyond money, Taipei also has a substantial edge in manpower. Looking at Taipei’s civil service, for example, Shih once estimated that the city has more than 70,000 public workers serving a population of about 2.7 million people. In contrast, neighboring New Taipei has fewer than 50,000 public workers dealing with a population of nearly 4 million. "Taipei’s public policy efforts are substantial and concentrated, which is naturally reflected in the quality of public services," Shih says. Yet, while Taipei has a major edge over other cities in most objective indicators, the city government has not fared nearly as well in the more subjective category of resident satisfaction. In CommonWealth’s city survey, Taipei Mayor Hau Lung-bin had the third lowest approval rating of the country’s 22 local leaders. "Expectations are different," explains Irving Yi-Feng Huang, the chairman of the Department of Public Administration at Tamkang University. Those expectations, he says, are colored by the city’s longtime status as a special municipality and Taiwan’s capital, and its high degree of exposure to the international community. Taipei, for example, ranked highly in the Economist Intelligence Unit’s Asian Green City Index in part because of its "pay-as-you-throw" waste collection policy, in which residents have to use and pay for specially marked garbage bags to dispose of their trash. Among Taiwan’s administrative districts, only Taipei could have pulled off such an initiative, Huang says, because the city’s residents are highly accepting of new concepts. In addition, Taipei is the only big metropolitan area in Taiwan where over 60 percent of its residents above the age of 15 have higher education degrees. The ratio in the other four municipalities is under 50 percent. Huang also discovered that Taipei students are far more likely than their peers outside of the city to show an interest in public affairs at home or overseas, "because there is a lot of information and many channels for participation." The convergence of these factors means that Taipei represents more than simply the country’s major economic hub, Huang says; it also has a relatively mature civil society. That means city residents have become increasingly demanding, presenting a growing challenge to the city’s political leaders. Though Taiwan’s four other special municipalities face inherent disadvantages in competing with the country’s capital, they are trying to catch up by relying on policies that showcase their strengths. Kaohsiung, for instance, ranked first among the five metropolitan areas for "social welfare" and for a key culture and education indicator – the "number of cultural activities organized per year" – a result that belied the city’s stereotype as a "cultural desert." As for New Taipei, though its economic vitality ranking based on objective indicators was second to Taipei’s, its progressive policies have resonated with New Taipei’s residents and given them greater confidence in the municipality’s economic competitiveness. No longer feeling like second-class citizens when compared to their peers in the capital, New Taipei residents expressed a high level of satisfaction that when combined with objective indicators helped pull it even with Taipei at the top of the economic vitality category. The biggest metropolitan area in central Taiwan – Taichung – also performed well in several key indicators. It ranked second behind Taipei, for example, in "annual population growth" (an economic vitality indicator) with a growth rate of 7.7 percent, reflecting the city’s attractiveness to outsiders in recent years. Perhaps even more noteworthy, Taichung’s crime rate (a governance indicator) was the lowest of the five municipalities in 2012 and its crime clearance rate approached that of leaders Taipei and New Taipei. In another governance indicator, "local tax revenue growth," Taichung’s 8 percent growth rate far outpaced the other four municipalities, and because of its ability to expand the revenue pie, it had greater fiscal leeway and was the only special municipality to reduce its debt burden last year. Among Taiwan’s 17 counties and small cities, Jinmen and Matsu (Lianjiang County) emerged on top after not even being included in last year’s survey because of insufficient data. "It’s not a surprise," says Shih calmly. "Many people ignore the fact that conditions on the outlying islands are like smaller Taipeis." Shih’s research indicates that these islands can be governed more effectively and comprehensively because of their small populations and areas, and civil servant-to-resident ratios that are even higher than Taipei’s. Jinmen’s finances are particularly impressive. Benefiting from the surplus contributed by the island county’s renowned liquor producer, Kinmen Kaoliang Liquor Inc., Jinmen’s "self-raised revenue ratio" is 65 percent, far exceeding the 54 percent ratio of runner-up Taoyuan County, which will become the country’s sixth special municipality next year. A frontline military fortress during the Cold War, Jinmen is reinventing itself as a prime tourism destination, and county commissioner Lee Wo-shi has embraced the idea of Jinmen as a "duty-free island" to further attract tourists. Seven duty-free stores already exist, and two major duty-free BOT (build-operate-transfer) projects are in the works, under the management of Taiwan Land Development Corporation and Ever Rich DFS Corp., respectively. This surge of economic activity has resulted in the creation of more jobs than there are people to fill them. Jinmen’s unemployment rate stands at only 1.3 percent, well below the prevailing 4.2 percent rate on Taiwan proper, and "some of the large-scale operations have even been recruiting from the concentration of Jinmen natives who have settled in Zhonghe and Yonghe (suburbs of Taipei)," Tamkang University’s Huang says. The arrival of MOS Burger and new bank branches also reflect the growing commercial opportunities in the outlying county, which drove Jinmen’s "urban land price index" up 36 percent last year, the highest in the survey ahead of second place Hsinchu County (a 32 percent rise). But with prosperity comes new challenges. Health care and transportation have long been the vexing problems for Jinmen residents, and the county finished last in the survey’s "culture and education" category, faring poorly in such indicators as "spending on education, science and culture as a percentage of total expenditures," the "number of cultural activities organized per year," and the "number of cultural activities attended per capita." Taiwan’s 17 counties and smaller cities will see a major change in 2014, with Taoyuan County being upgraded to Taiwan’s sixth special municipality, leaving Zhanghua County as the only remaining administrative district in the group with a population of over 1 million. But the small sizes of the remaining districts do not mean a lack of development potential. In one indicator of such potential, "median household disposable income," Hsinchu City (NT$960,000) and Hsinchu County (NT$950,000) fared better than every special municipality except for Taipei. Hsinchu County commissioner Chiu Ching-chun boasts that "population growth" in his county attained 12 percent last year, the highest of any administrative district on Taiwan proper, and it ranked second behind Taoyuan County in the "economic vitality" category. Chiu said he has aggressively promoted five major sectors during his term – solar energy, biotechnology and health care, cultural and creative industries, tourism, and specialty agriculture – and his efforts to solicit new investment have paid off. The county ranked first among non-special municipality districts in the Ministry of Economic Affairs’ review of local government investment promotion, and its unemployment rate is the lowest of any district outside of the country’s outlying island counties. "We have attracted many high-tech sector immigrants who are moving to Hsinchu County to buy a house and raise a family," he says. In two indicators that measure the quality of an area’s human capital stock – the "percentage of residents above the age of 15 with higher education degrees" and "the percentage of the employed workforce with vocational school degrees or higher" – Jiayi City (52 percent and 59 percent) and Hsinchu City (47 percent and 55 percent) were second and third behind Taipei. Hsinchu City’s strong foundation of human capital helped it rank at the top of the "culture and education" category among the 17 counties and cities. Within the category, the city’s high scores for "percentage of dropouts returning to school" (over 90 percent) and "elementary schools with reading promotion teachers" (88 percent) reflected the city’s efforts to deepen its cultural and educational roots. As for "governance," five of the 17 second-tier counties and cities – Taoyuan County, Jiayi City, Hualian County, Yilan County and Hsinchu City – were able to reduce their debt last year but also finished in the top 10 for governance. This demonstrates that despite facing spending constraints set by limited revenues, local governments can still govern effectively and in a way that resonates positively with their constituencies if their policy execution is strong. The survey also found that Taiwan’s unbalanced regional development remains an indisputable fact. Nantou, Yunlin and Pingdong counties among others continue to struggle with such chronic problems as minimal resources, a net population outflow and an aging resident base. Shih said these poorer counties have no way to compete with other counties in the country and shouldn’t even try. Instead, he advised their leaders to recognize the difficulties they face and reposition their counties, even if that represents a daunting challenge. "Poor counties should devise key indicators that are suitable for them and then try to improve compared to the previous year," Shih said. "If they can, it will show that the leader is making good use of the resources at hand and encouraging the government to achieve breakthroughs in the face of challenges."